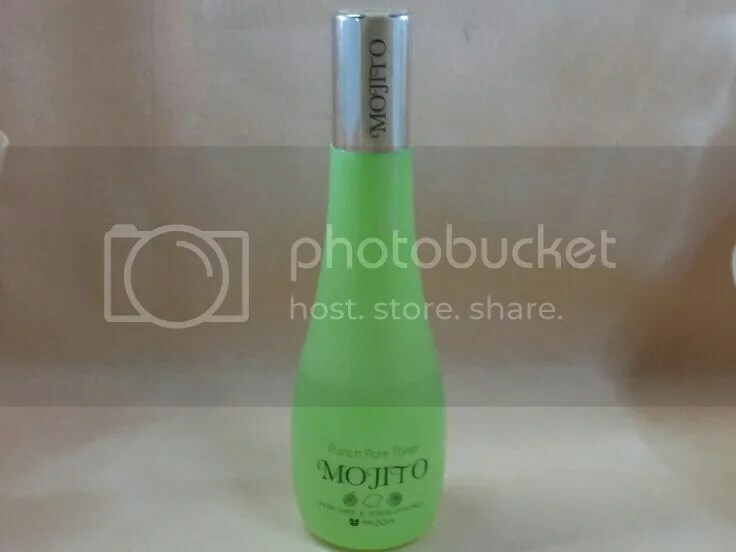 A really quick review on a toner today – the Mizon Mojito Punch Pore Toner. This claims to help in pore care and sebum control. I got mine from a Memebox awhile back, so I don’t know how much it cost in stores but a quick google check showed a price of about USD18. It has ingredients that could be found in a real mojito – lime, apple and peppermint leaf water – although these are pretty far down the list. I think the bottle is adorable – a green shapely bottle. This is full size and have 150ml of product; I thought it would be less as it looks like a small bottle. The smell of lime is quite strong but it doesn’t stay on the skin. To use, I just pour some on a cotton pad and wipe over my face. I found this slightly different from the regular breed of Korean toners which tends to prep the skin for more hydration – this one works more like a western kind of toner that works as an astringent to control sebum; alcohol is the third largest component. It’s slightly drying on my skin, but not overly so. I found it very useful when my skin is particularly spotty – it really helps to control my zits from growing! When my period is around the corner, my skin can feel particularly clogged and gross, and I’ve found a wipe with this makes it feel less congested and oily. In short, I really enjoyed this toner. If you’re thinking it’s a traditional korean toner, it’s not; but it does what it claims to do and it feels really refreshing to use. I have dry skin, and while it is slightly drying, I think using it at the right time offsets the dryness; just don’t use it all the time, only when needed. Is it just me or does anyone else get irritated when brands rename their products, without a substantial change in the product itself? I just don’t understand why they do it! 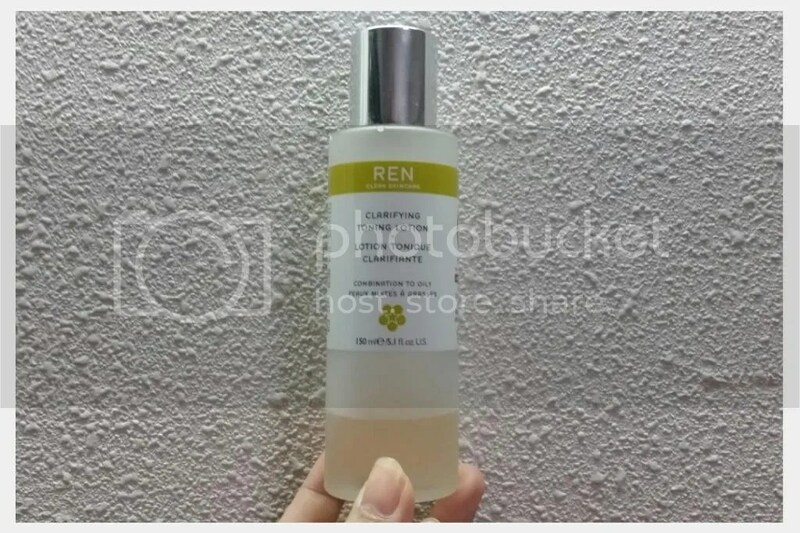 I have the older format of this REN Clarifying Toning Lotion but it is now know as the REN Clarimatte™ Clarifying Toner. Whatever the name is, it’s the same product. If you have the old one, you don’t have to run out to buy the ‘new’ toner. 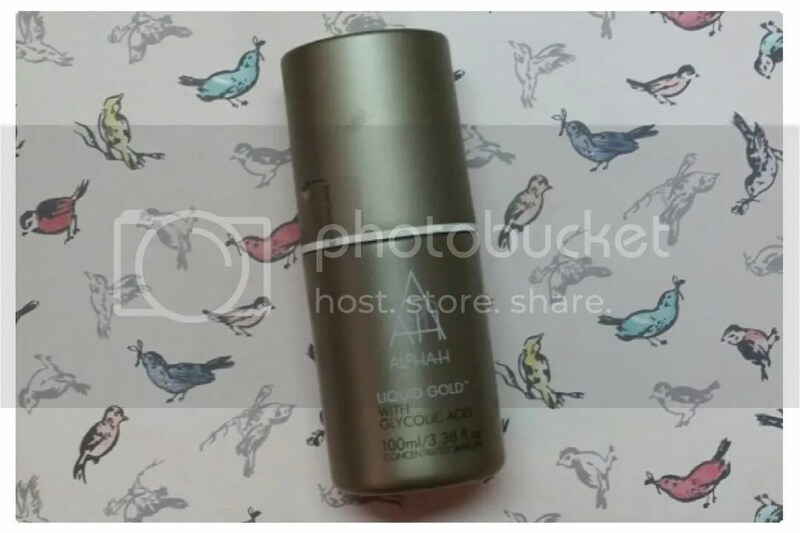 So I caved and bought into the Alpha-H Liquid Gold hype… there were just too many raves for it that I could not restrain from trying one out for myself, and I love it! I bought this from the Luxola website during a 30% off sale, and its original price is SGD56 for a 100ml bottle. Our best selling “cult” skin resurfacing treatment uses a state of the art, low pH delivery system to effectively diminish wrinkles, pigmentation and sun damage. The Glycolic based formulation works like an “overnight facial” to brighten and revitalise tired, ageing skin, and radically improve appearance of the complexion. For mature, sun damaged, prematurely ageing and for acne-scarred skin. This comes packaged in a little plastic flip-top bottle, and a cap over it; it’s practical but not pretty or fancy. I’ve read a lot of reviews that say this has no smell, but I actually can smell something chemical. The product is a clear transparent liquid, very fluid in texture. Now I don’t have mature, prematurely ageing or acne-scarred skin, but I do have some pigmentation issues, and small little bumps plus hormonal pimples that comes once a month. My biggest concerns are the little bumps and old scars from the monthly breakouts, as well as dullness. The directions on the bottle says to use this 3-4 nights a week, applying with a cotton pad to cleansed skin while avoiding the eye and lip areas; for best results, night cream should not be used to allow the Liquid Gold to work “uninterrupted”. I have actually deviated from the directions – I apply it with a cotton pad on alternate nights, but with my regular serums and moisturizers on top. I did this mainly because the tingling got too much for me, and I wanted to calm my skin down. Even after using nearly the entire bottle up, I can still feel the tingling – it’s not painful but I can feel my skin getting irritated. Even though I did not allow the Liquid Gold to work “uninterrupted”, I can still see results. I find the little bumps on my skin a lot less significant, and my skin looks ‘clearer’ and somehow brighter. I don’t have big issues with my pores, but I do feel they look ever so slightly better and less visible. I don’t think it did very much for my old pimple scars though. In all, I really do enjoy this. It is so hard to find a product that actually helps with the little bumps on my skin and this one actually works, without a crazy price tag! The tingling takes some getting used to, but I find some moisturizer eases the irritation without removing the good effects. Definitely something that I will recommend and repurchase! A quick and simple review today on a toner that I have been enjoying – the Simple Kind to Skin Soothing Facial Toner. I’ve tried a few skincare items from the brand, and have generally liked them all. Their products are reasonably priced, and like its name, very simple with no fancy packaging, focusing on using the purest ingredients with no colour and perfume. 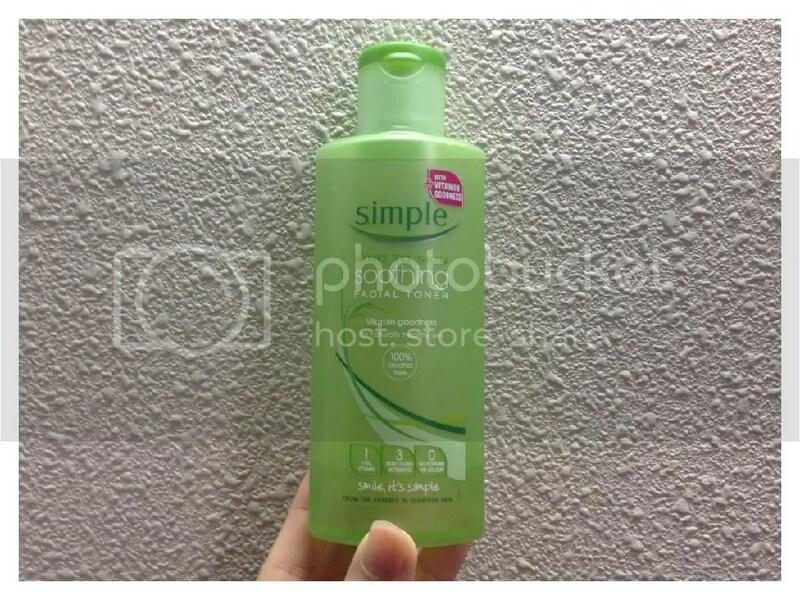 I find myself reaching for Simple’s products whenever my skin is being irritable. Our special blend of Simple skin toning goodness containing Pro-Vitamin B5, Chamomile, Witch Hazel and Allantoin, helps to keep your skin toned and refreshed. No artificial perfume or colour. No unnecessary ingredients so it won’t upset your skin. Dermatologically Tested and Approved. The packaging is a simple plastic green bottle, with a flip cap. It’s not the best bottle, but at its price I don’t have a big issue with it. To apply, I just pour some on a cotton pad and wipe it across my face. The product itself is rather lovely. It feels just like water but it does make my skin feel clean; I find it able to remove some remnants of makeup that my makeup remover had failed to remove. The toner does not contain any alcohol in it and is refreshing without being drying. It does not have a scent. What I really enjoy about this is whenever my skin is irritable – such as sudden angry spots or dry itchy patches, using toner usually aggravates the situation. But as a regular toner user, I don’t feel like my whole skincare regime is complete if I don’t use it – so I reach for this. This does not irritate my skin and I actually find it rather soothing whatever the problem is. Definitely recommended this for anyone with sensitive skin or having problems with using a toner, looking for one at a reasonable price. Have you tried this toner, or anything from this brand? During a recent facial treatment, my facial therapist told me that my skin is very “absorbent” – that it is very dry so it soaks up all moisture quickly and it also soaks up all dirt and dust. So her advice was to use a non-drying toner before bed and after I wake up every morning. It might sound like a very simple task – but for someone with very dry skin, it’s not easy to find something that I can use twice a day without drying out my skin more! I was not a fan of Etude House products – they look childish to me but I walked past one day and saw this Skin [Mal:Gəm] Moist, a “moisture care freshener” targeted at people with dry skin, I thought why not? It’s a good size product at 250ml, and is quite affordable. I like the packaging – it’s plastic; I accidentally dropped it one day and it just bounced off the floor! Wow, moisturising AND pore cleansing? SOLD! I have been using this for a few months, and I have to say that I am pretty impressed with it. The texture is unlike other toners – most toners feels like water, but this is thicker in consistency and less fluid. It’s clear in colour and does not have any smell. On application, my skin feels quite moist but does not have the squeaky clean feel that I get from most toners. My skin does not feel dry despite using it twice a day. I also find that my skin feels and appears to be less clogged – I don’t have as much blackheads as before and my complexion appears to be clearer. I don’t usually get breakouts but I do get a lot of little bumps of clogged pores but after using this, the frequency and amount of clogged pores seem to have reduced! All in all, I recommend this for anyone with dry skin looking for a moisturising toner. This product has certainly changed my attitude towards the brand!